This is not your ordinary workers' compensation book. Workers' compensation coverage is relatively easy to understand. It's the legal, procedural and contractual issues surrounding workers' compensation that are complicated. This book is delivered as a downloadable PDF. Click here if you prefer to order the printed edition. 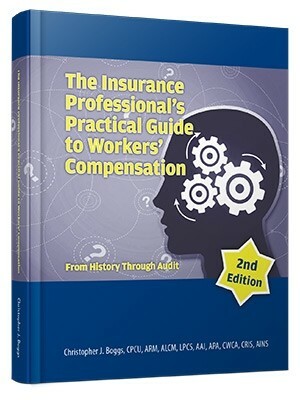 In "The Insurance Professional's Practical Guide to Workers' Compensation," Boggs addresses in clear, jargon-free English many of the concepts, policies and practices in workers compensation that brokers, risk advisors, and corporate risk managers need to know. The chapters, such as on which injuries and which workers are covered, free the reader from having to wade through dense legal and regulatory treatises. Boggs explains to non-lawyers legal aspects of workers compensation. If you need to use the book as little as one time a year, get it, because you'll probably need it much more often.